The Matrix: Path of Neo is a video game for the PlayStation 2, Xbox and Windows based on The Matrix trilogy by the Wachowski brothers. 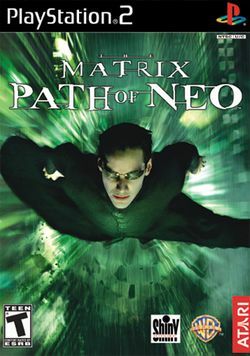 The game allows players to control Neo, the main character in the Matrix trilogy. The game starts with the player choosing between the red pill and the blue pill. Upon selecting the red pill, the player is taken to a version of the "Lobby Shooting Spree" level where they must battle security guards, police officers, employees of the Merovingian, agents and Agent Smith. Depending on how many you defeat, you are give the option of playing the game on Disciple (Easy) mode, Master (Normal) mode, or The One (Hard) mode. After this, the player is taken to training. Training starts with learning Kung Fu. The first move you learn is the silent takedown. You continue through the level fighting warriors until you reach the tournament. In the tournament, you fight through four waves of the warriors (starting with three white uniforms and ending with three red uniforms). You then gain "focus", Neo's ability to control the matrix and battle a "master". Upon defeating the master, you are taken to the next level, "Sword Training". In this level, you must battle a Swordsman with a few special abilities. After you have made a few good strikes, he will jump onto a nearby ledge and say, "That was a lucky strike. And your last!" You then gain focus and continue fighting. Once the swordsman loses all his life, he will fly to the roof of a nearby cottage and Trinity will join you. You will then fight him again. Shortly after, he flies to a formation of two ledges stacked up. He then creates 2 copies of himself and you fight them. After you kill his two copies, he jumps on the ledge again and multiplies, this time creating 3 copies. Upon killing them, he makes 4 copies. Once you kill all of them and kill the swordsman, there is a cut-scene and after the ability selection screen, you enter "Winter Training". This page was last edited on 30 May 2016, at 14:31. This page has been accessed 8,922 times.